I am a LaTeX user. However, the unfortunate reality is that Microsoft Word is in very common use and if you’re collaborating with other people, one of your collaborators is going to insist on using Word. The EUSES group at Oregon State University has traditionally used Word on most of their projects. One thing that I like about LaTeX is that its citation management is quite good – it’s easy to add references, move them around, and have the Bibliography build properly. Right now, I use BibDesk for much of my reference management. It’s extremely lightweight, stores data in BibTeX format, and is quite portable across systems. One of the limitations of BibDesk is that it doesn’t handle files very well. You have to often add them manually to each entry, and it doesn’t keep them organized nicely on the file system. One may wonder – why keep files at all? Can’t you just grab them from the ACM Digital Library when you need them? Well, yes, but I like files. If I have them, I can work offline. I can use Spotlight (rather than Google) to look for files on my hard drive. I also need files so I can transfer them to my iPad and iPhone. There are also a number of references that simply aren’t on the digital library and have taken a bit of effort to acquire, so I’d rather not lose them. This led me on a quest to find a slightly better reference management system. There’s actually no lack of citation managers out there. Endnote is a relatively long-standing program that is known for providing citation management to Word. Papers is an award-winning paper management program for Mac OS X. Mendeley is a free cross-platform solution that can scan PDF files and automatically fill in a citation with data online. Mendeley Desktop. Notice how OMGHUGE it is. My choice for about the past year was Mendeley. It is a closed-source program that has an online web presence and a sync server, meaning that once you put your papers into the software, it can display them for you on the web, or sync them onto a new computer. You can also share groups of citations with others – great when you’re surveying literature. However, the program is big, slow, and uses tons of screen space. I’ve also been experiencing issues with it recently of it not quite finding the right information based on a search of the title. When it was given the paper’s title, it was often filling in the journal with “Society” or something ridiculous like that. It was also not recognizing conference papers as such, often leaving them as the default “Article”. I began to search for something more robust. I had actually heard of Zotero about the same time I acquired Mendeley (thanks Neil! ), but I hadn’t ever bothered to figure it out. Then, I heard that there was a plugin to Microsoft Word that helped you manage references. Zotero is a free Firefox add-on. It lives and dies with the web browser, and by default is a little panel at the bottom of your browser window. 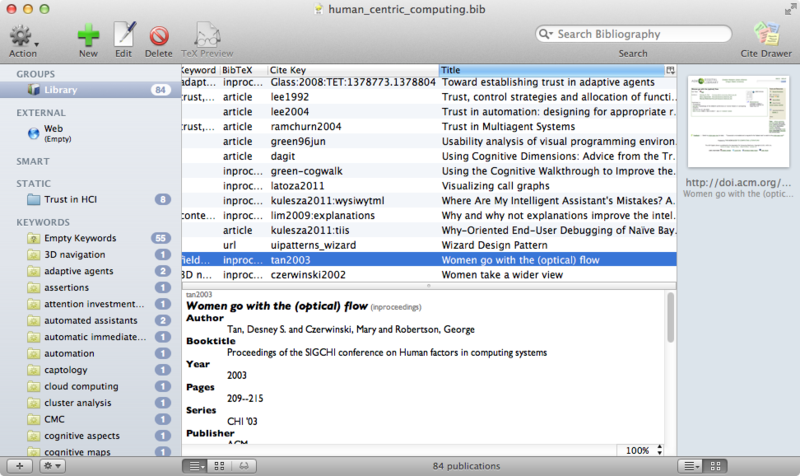 It, like Mendeley and BibDesk, has the three-panel layout that is “Citation groups”, “Citation list” and “Citation details”. The “Automatically Capture Bibliographic Information From The Web” button (it doesn’t have a name in the Zotero documentation) appears on pages like ACM Digital Library, IEEE Xplore, and Amazon, where information about references is displayed. When you click this button, it creates an entry for you and populates it with the correct information. Suddenly, I realised that this is a tool that I’ve wanted for a while, because where do I get most of my scientific articles from? I get them from the Web. So, rather than having to copy and paste the BibTex entry into BibDesk (annoying but doable) or downloading the PDF and dragging and dropping it into Mendeley (and then having Mendeley get the information with a 70% chance of it succeeding), I can just skip the process and import it all directly. In addition to being able to import references from the web, Zotero integrates with Word. You need to follow the instructions for installing it which includes downloading Zotero, a Python plugin, and the Word add-on. If you’re using the latest-and-greatest version of Firefox, you might have to also download the Mozilla Add-on Compatibility Reporter to force the Word extension to load (it turns itself off because it’s not certified with the latest version of Firefox, but I force-loaded it and so far don’t have any problems). Zotero in Microsoft Word. There is a toolbar as well as a "Script" menu item in Mac OS X. When you restart Word, you’ll get a little toolbar as well as a script menu. The script menu contains items that are relatively self-explanatory. You can add citations, add the bibliography, edit the citations and bibliography, refresh the document if you change the database from Zotero, and set your preferences (i.e. your citation format). One reason why I like this tool is that it’s very lightweight. You can send this version of the document to someone without Zotero, and as long as they don’t try editing all of the fields, they will see the references just fine. This enables you to collaborate with them without having to worry about getting the references out of format (which was something that happened a lot in EndNote X2). However, Zotero also has cloud-based sync and group-sharing features like Mendeley does, so you can use those features as well to keep your computers in order, and to share citations with your collaborators. Right now I’m pretty sold on this tool. It is cross-platform (though unfortunately tied to Firefox, but I hear there are Chrome and Safari alphas), syncs documents, imports data automatically, keeps files organized (it saves them in your Mozilla Profile unless you tell it otherwise), and integrates with Word. And, it costs no money. It even imports and exports BibTeX, meaning that I don’t have to give up or even migrate from BibDesk. If you’re struggling with reference management then I think Zotero is something you might want to try. Happy citing! 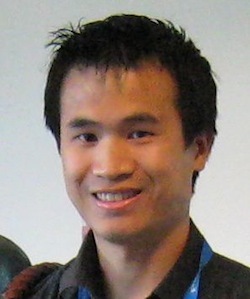 This entry was posted in LaTeX, Personal productivity and tagged Citation management, Endnote, LaTeX, Mendeley, Microsoft Word, Papers, Zotero on November 3, 2011 by irwinhkwan.